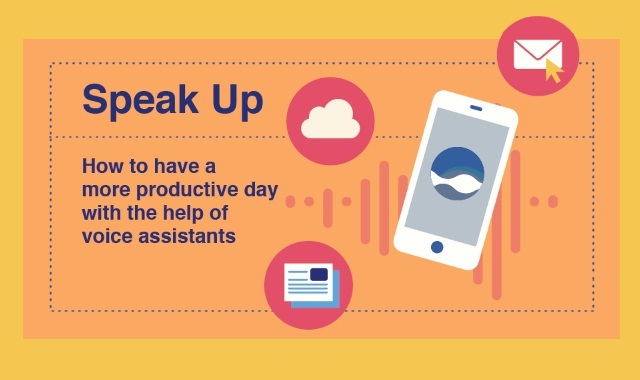 Speak Up: How to have a more productive day with the help of voice assistants #infographic ~ Visualistan '+g+"
If you’re hesitant to use a voice assistant—and think this technology is just for Millennials—think again. One survey found that people used voice assistants for three primary reasons: Because they’re fast, because they read answers back to people, and because people don’t have to type. From the most basic tasks to more complex ones, voice assistants can help you get tackle your to-do list, stay on top of travel details, and keep you accountable. Check out the infographic below to learn how you can boost your productivity with a voice assistant and how Apple’s Siri, Amazon’s Alexa, Google’s Assistant, and Microsoft’s Cortana stack up.